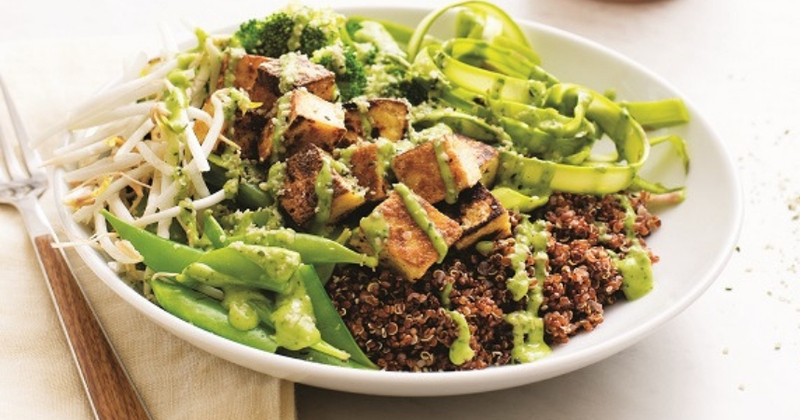 A Buddha Bowl is a big bowl of plant-based goodness. 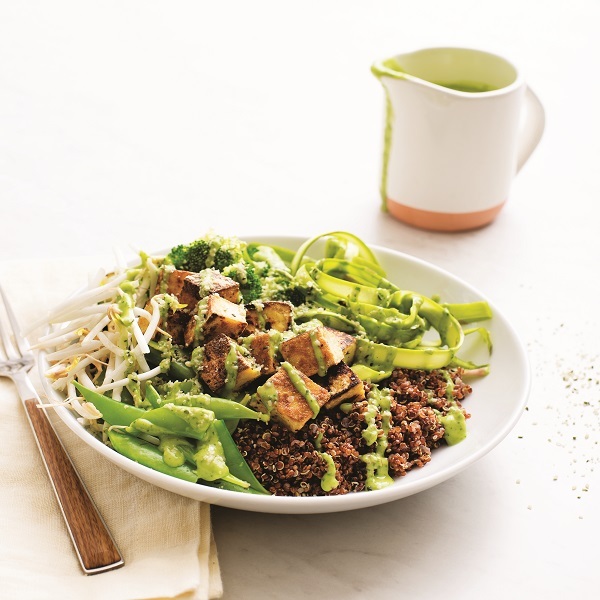 Buddha Bowl ingredients and portions are rooted in the principles of Chinese Medicine to dictate the ideal combination of wholegrains, vegetables and protein. The beauty of Buddha Bowls are that you can tweak ingredients to your own personal flavour choices. You can also serve enormous, post-workout breakfast or lunch bowls, or smaller, snack style bowls. These are ideal for DIY dinner parties too. Simply lay out all the ingredients and allow your guests to build their own bowls. The great thing is, most of the ingredients you need will be in your pantry or fridge anyway so Buddha Bowls are a great way to use your leftovers. Brilliant! A healthy meal that is good for the planet. The following recipes are extracts from Buddha Bowls by Kelli Foster © 2018 Quarto Publishing Group USA Inc. Combine the quinoa, water, and a generous pinch of salt in a medium saucepan. Bring to a boil, then cover, reduce the heat to low, and simmer until tender, about 15 minutes. Remove from the heat, cover with a lid, and steam for about 5 minutes. Heat the oil in a large skillet over medium-high heat until shimmering. Add the tofu, season with salt and pepper, and cook until the bottom is lightly browned and crisp, about 2 minutes. Flip and continue cooking until all sides are browned. To serve, stir a spoonful of the sauce into the quinoa, then divide among bowls. Top with tofu, broccoli, asparagus, snap peas, and bean sprouts. Drizzle with Avocado Green Goddess Dressing and sprinkle with hemp seeds. Combine the avocado, yogurt, herbs, garlic, oil, vinegar, lemon juice, salt, and pepper in the bowl of a food processor. Blend continuously until smooth and well combined, scraping down the sides of the bowl as necessary. With the food processor running, add the water, 1 tablespoon (15 ml) at a time, until it reaches the desired consistency. Notes: The sauce can be stored in an airtight container in the refrigerator for up to 3 days. Preheat the oven to 400°F (200°C, or gas mark 6). Combine the rice, water, and a generous pinch of salt in a medium saucepan and bring to a boil. Reduce the heat to low, cover, and simmer, stirring occasionally, until the rice is tender, about 30 minutes. Meanwhile, prepare the tofu and vegetables. Cut the tofu into triangles. Whisk together the tamari, 1 tablespoon (15 ml) of the sesame oil, honey, and sambal olek in a shallow container. Add the tofu, stir to coat, and marinate for at least 10 minutes. Arrange the tofu in a single layer on one side of a large, parchment-lined, rimmed baking sheet, and discard the remaining marinade. Toss the broccoli with the remaining 2 tablespoons (30 ml) sesame oil, ginger, and salt. Arrange in a single layer on the other half of the baking sheet. Cook until the bottom of the tofu is lightly browned, about 12 minutes. Flip the tofu, stir the broccoli, and cook for another 12 minutes. To serve, divide the rice among bowls. Top with tofu, roasted broccoli, shaved carrot, and avocado. 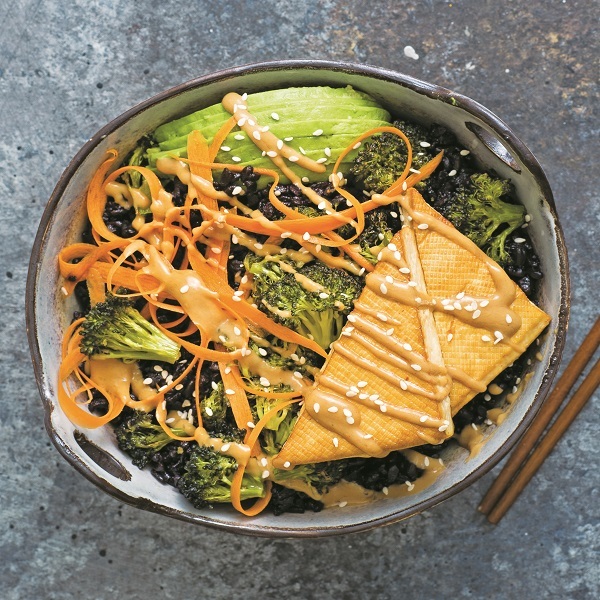 Sprinkle with sesame seeds and drizzle with Peanut Sauce. Make It Vegan | By simply swapping the honey for agave syrup, this recipe easily becomes vegan-friendly. Don’t skip the sweetener altogether, as it’s essential in keeping the marinade balanced. Combine all the ingredients in the bowl of a food processor or blender. Process continuously until smooth and well combined, about 2 minutes. Serve immediately or store in a covered container in the refrigerator until ready to use. Notes: The sauce can be stored in an airtight container in the refrigerator for up to 4 days.